Welcome to Apple Country Woodcrafters! 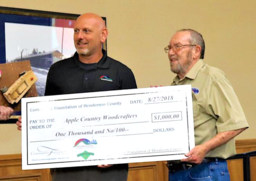 Apple Country Woodcrafters is a 501(c)(3) non-profit organization whose goal is to develop woodworking projects to benefit our community and the education of our members. Our largest effort is making wooden toys for local underprivileged children at Christmas. For the past few years, the number of toys has exceeded 2,000. 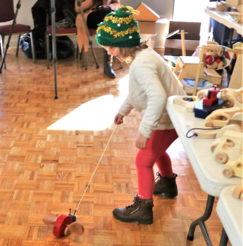 This is enhanced by the camaraderie enjoyed among our members, whose common interest is a love for woodworking. We are delighted that you are visiting our website and welcome you to join us. April 23 Workshop - Sanding & Finishing by Mike Ziegler. 9AM at the ACW shop. Tic-tac-toe is a popular game with a large age range and is gender non-specific. Member Bill Kane found this one in a book in our very own library (Great place to look for ideas.) and made it for a recent club meeting. Horizon Heating & Hannah Flanagan's Pub, have graciously donated funds to help Apple Country Woodcrafters with our operating costs. If you would like to help Apple Country Woodcrafters serve our community, you can do so through the Legacy Giving Program. By clicking the link above you can help ACW continue its mission for generations. Our thanks to those who help us serve our community.